Palm Valley is a 9,000-acre master-planned community located in Goodyear, Arizona. The community was started in 1993, was built in phases and now includes several thousand homes and continues to grow. Palm Valley offers its residents churches, schools, medical services, professional and commercial offices, banks, retail centers, restaurants, hotels, parks, golf courses, and fitness centers all within minutes of the heart of the community. Golfers in the area enjoy the Palm Valley Golf Club which is home to the Championship Palms Course. It's a challenge for the low handicap golfer yet still enjoyable for anyone who wants a good experience regardless of skill level or score. The par-72 course covers 7,015 yards from the back tees and features a lake on the left side of the fairway that circles the three-tiered green. There is also a golf shop, practice facility, bar, and restaurant, plus a spacious patio offering amazing views of the golf course as well as the surrounding mountains. Palm Valley is also where the Waterfront Pavilion is located. Here weddings, banquets, and special events are often held. Goodyear also offers many things of interest to Palm Valley residents. For outdoor experiences, the Estrella Mountain Regional Park has trails for hiking, and in the evening, rangers lead the way for hikers to be able to view the area by starlight. You might even have a chance to see scorpions with bodies that glow in the dark. For those who love history, The Bible Museum has biblical artifacts that go back 2,100 years. The exhibits include parts of the Dead Sea Scrolls, original copies of the 1611 King James Bible and some rare theological books. 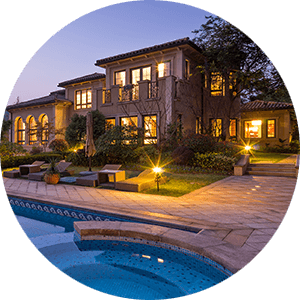 Palm Valley real estate has different representations from the different phases of development. 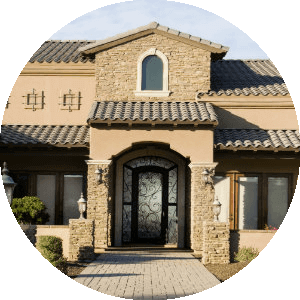 You will find single-family Spanish style ranches and Tuscan homes on wide streets lined with beautiful trees, great mountain view, and friendly neighbors. Within the neighborhoods are pocket parks and playgrounds for families to enjoy. There are excellent dining options, and nearby are major retailers and office parks. 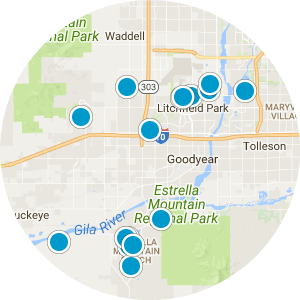 When you combine the many amenities from these neighborhoods with those of Goodyear and nearby Phoenix, this is a must consider destination for homebuyers searching in the Phoenix area. 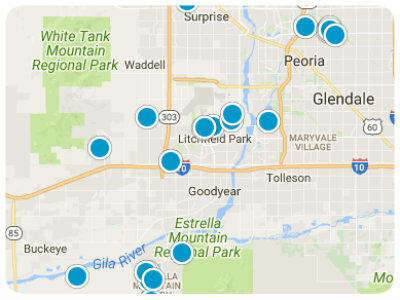 If you would like more information regarding homes for sale in Palm Valley, Goodyear, Arizona, please contact us today and allow us to assist you.